HTML5 is quickly becoming the go to OS for any digital signage player. 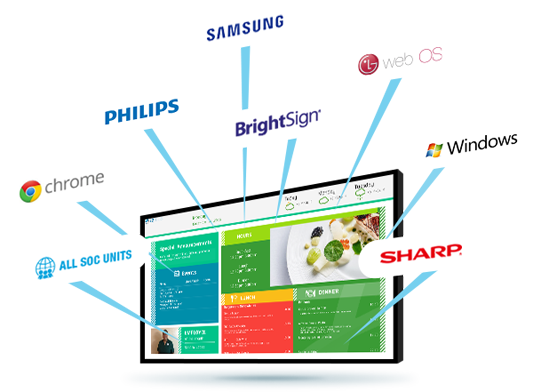 22Miles delivers the total solution with compatibility to any supported player or display SOC manufacturer leveraging the power and simplicity of web-based applications. 22Miles works with market leaders in the space including BrightSign, Chrome, Samsung, LG, Phillips, Sharp and leverages an HTML5 wrap to easily interface across a fast and flexible “agile design”. HTML5 Signage through 22Miles provides the best device platform for digital signage, web & kiosk use-cases. Carry2Mobile(TM) empowers the user to experience content on a mobile phone with no app download or installing necessary, just pure HTML/Web interactive app design.